This page provides an overview of passenger rail travel options in the Pioneer Valley region of Western Massachusetts. The Hartford Line, which was launched in June 2018, is a regional passenger rail service between Springfield and New Haven, CT with intermediate stops in Windsor Locks, Windsor, Hartford, Berlin, Meriden, and Wallingford. The service connects at New Haven Union Station with Amtrak’s Acela Express and Northeast Regional services, Metro-North’s New Haven Line service, and CTDOT’s Shore Line East service. North-south service in the valley is provided by Amtrak’s Vermonter train — which stops locally in Springfield, Holyoke, Northampton and Greenfield — once a day in each direction in the afternoon. In June 2019 this service will be supplemented with additional Amtrak service between Greenfield, Springfield and New Haven. East-west service is provided by Amtrak’s Lake Shore Limited train which stops locally in Springfield and Pittsfield — once a day in each direction in the afternoon. The regional hub for passenger rail and intercity bus service in the Pioneer Valley is Springfield Union Station. For local details — including parking — click on one of the pages listed below for the station that you would like to travel to or from. Driving to Connecticut to take Metro North’s New Haven Line to New York City? If you’re doing this we now recommend that you simply drive to the Union Station Garage (1755 Main Street, Springfield, MA) — where you can now park from 5 AM to midnight for $5 — and take a Hartford Line train to New Haven, where you can connect with Metro-North. Worcester Union Station | 2 Washington Sq, Worcester, MA — where parking ranges from $4 – $16/day. Grafton station | 1 Pine St, North Grafton, MA — the next station on this line after Worcester — where parking is $4/day. Using this station, which is only 4 miles further drive, will also save you about 10 minutes in travel time in each direction — since you won’t have to travel into/out of Worcester. 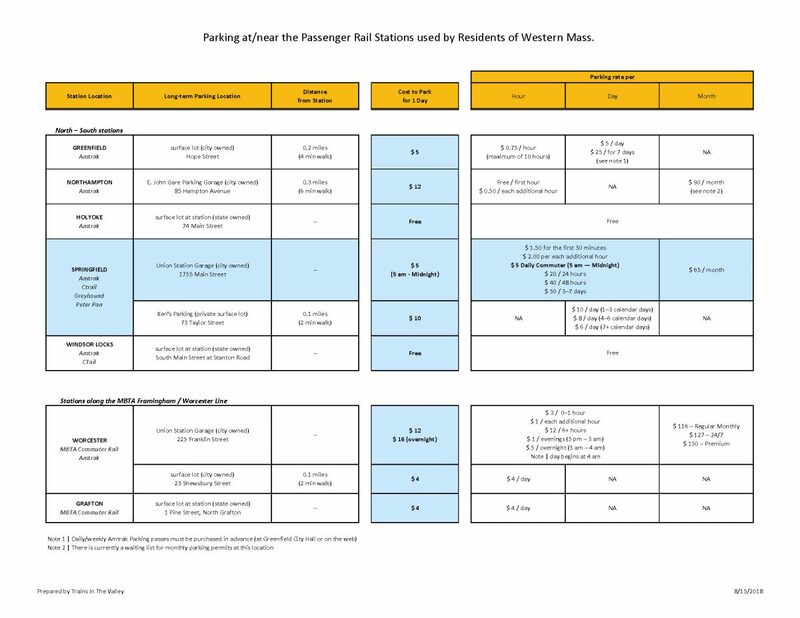 Here is a comprehensive listing of the parking options at/near the passenger rail stations that are commonly used by residents of the Pioneer Valley. The parking rates listed on this chart were last checked in March 2018. If you find a different rates please let us know so we can update the chart. The cost of an Amtrak ticket is generally higher when you purchase your ticket less than about 3 weeks before your travel date — so book early to get the best price. Fares are generally higher during holidays and peak travel periods and can vary based on the day of the week and time of day. For additional details check out Amtrak’s [Guide to Fares] web page. Hint! If your travel dates are flexible and you’re looking for a lower ticket price be sure to check out the unofficial AmSnag website. The AmSnag site allows you to compare ticket prices between any two points on Amtrak’s network over a range of dates, e.g., you can compare the ticket price for travel from Northampton (NHT) to New York City (NYP) for the next 30 days. 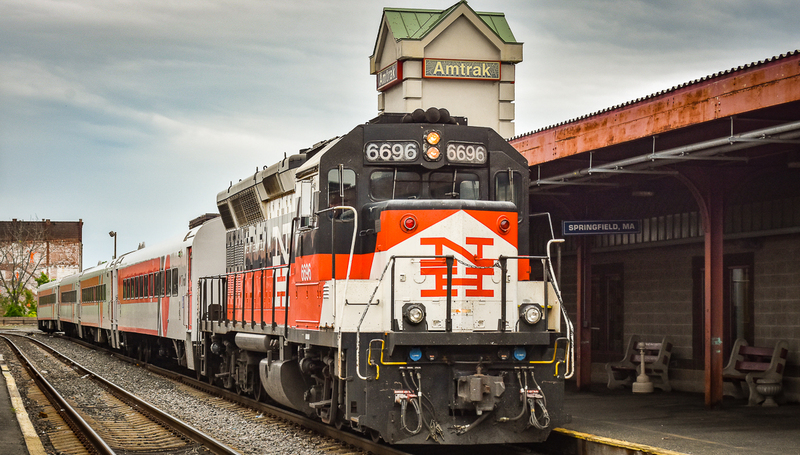 If you have been using Amtrak to travel from Springfield to Bridgeport, New Rochelle, New York City, or Stamford you will find that traveling on the Hartford Line, with a connection to Metro-North, is less expensive than an Amtrak-issued ticket. As example — the cost of a off-peak one-way trip from Springfield to New York City (Grand Central) — on the Hartford Line and Metro-North — is $30.50 (and just $18 for a senior) if you purchase your tickets from a CTrail ticket vending machine. An Amtrak-issued ticket from Springfield to New York Penn Station will costs from $38 to $98, depending on how far in advance you purchase your ticket. Peter Pan Bus Lines operates an extensive network of short and long-distance intercity bus routes from its regional hub at Springfield Union Station. Peter Pan’s station stops in the Pioneer Valley include Amherst, Charlemont, Deerfield, Greenfield, Hampshire College, Holyoke, Northampton, Shelburne Falls, South Hadley, Springfield, and UMass Amherst. Greyhound Bus Lines provides service in the Pioneer Valley, from Springfield and Greenfield, to/from Albany, White River Junction, Boston, and New York City. The Pioneer Valley Transit Authority (PVTA) operates local fixed-route bus service in Hampden and Hampshire counties. The Franklin Regional Transit Authority (FRTA) operates local fixed-route service in Franklin County as well as a service that operates between Greenfield and Northampton. You can get directions for driving, public transit, walking, biking, and flying on Google Maps. In our region the public transit portion of Google Maps includes the schedule information for Amtrak, Greyhound, and Peter Pan as well as the PVTA and FRTA local bus networks. Note that schedule information for Hartford Line trains operated by CTrail is not currently available on Google Maps. CTDOT tells us that they are working on this. For help using Google maps click on this link.